The safety of commercial dog treats has once again been brought into question. Unfortunately many more dogs have become ill, and some have passed away. The FDA has recalled many brands of jerky dog treats. They have even put together a handy Fact Sheet to help those who may have had contact with any jerky treats. Please review this information so that your dog, or a dog you know, can be protected from tainted treats. After educating yourself on the potential dangers, why not rest easy knowing that your dogs jerky treats have come from YOUR kitchen! 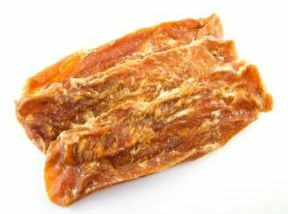 Chicken Jerky Dog Treats - This is by far the most popular jerky dog treat to make. You can even see how other dog lovers have made their own treats like Olivia from Sweden. 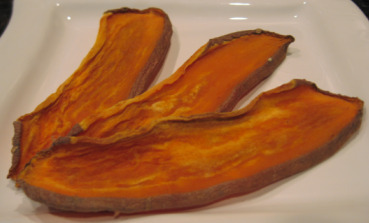 Dried Sweet Potato Treats - Not all jerky dog treats need to be meat based. Try out this healthy and budget friendly treat, too. Have your dog feel like Lucky from Milwaukee. 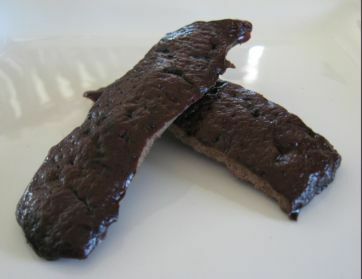 Liver Jerky Dog Treats - Liver takes a little longer to dry than other meats, but your dog will love you more than you ever thought possible! :) Try organic chicken livers or other organic organ meat, once you get the hang of dehydrating liver. 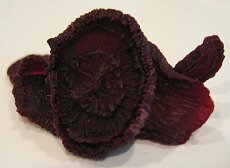 Easy Beet Chips - These are as easy as opening a can of sliced beets. You can use fresh beets, too. Although they end up small, they make the perfect training reward. 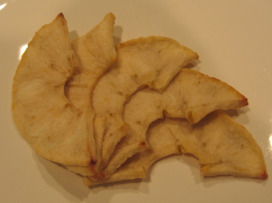 Dried Apple Slices - Last, but not least, a treat the whole family will enjoy. Don't take it from me, Lizi & Preci, love them, too! It is now safer than ever to make your own homemade dog treats. If time or experience is standing in your way, push it aside because I have the answer for you! 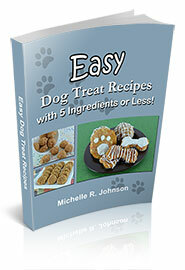 My eBook is full of super EASY (and very healthy) dog treat recipes. There are step by step photos of every recipe so you will know exactly how to make each original recipe. Later this month is a food filled holiday. Be sure you keep your dog safe and secure no matter what your plans. Turkey is a lean and healthful meat choice for most dogs. If you can't fit it into your dogs treats, why not try some Canned Turkey Dog Food for a special treat. Or, if your dog is watching his weight, how about a fun new Turkey Dog Toy to be a part of the season. "My question is can I use other raw peanuts as I am not sure whether I will be able to source red Spanish peanuts here in South Africa. I just want to check whether others will be fine." "Chef's Answer: Yes, you can use Virginia or Valencia peanuts to make homemade peanut butter. I recommended the red Spanish peanuts because they have a higher oil content. If you use the other varieties of peanuts you may need to add a little more coconut oil. Start with the tablespoon in the recipe and see how the butter comes together. If it seems dry, add 1 teaspoon extra at a time and continue to process and scrape the bowl." Look for Raw, Shelled Peanuts online if you can not source any in your local area. "I want to thank you for all the newsletters and recipes. I have made a lot of the treats for my dogs, and they love them. " "I just wanted to let you know, that I am addicted to your website and newsletter!!!! I am baking my Stardust homemade treats, and having a blast! I am also recommending this to all my friends and family who have dogs as well....please continue, and know that you are now on my bookmark list next to Vogue:) Thank you for this website!!!"